7″ square white flexi, featuring an outtake from the album “Alcoves”. No, I’d rather stay inside and pick up the flexi disc ‘On Or Near Surface’, which Celer announces, is a bonus track to the ‘Alcoves’ album. I can’t drag my turntable outside on a sunny afternoon’s walk, can’t I? But I was thinking “Celer and vinyl”; is that a good combination? 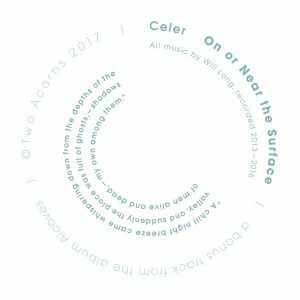 Now, obviously I am known to argue that good techno surely should be on vinyl, delicate ambient on CD (or higher bitrate downloads) and gritty noise on a cassette, so why should Celer put his delicate music on what is clearly an inferior medium, the flexi disc? Now, I love flexi-disc, ever since as a fifteen year getting one with the music magazine that proofed to be so important in my life, and partly that is because the quality easily deteriorates and I guess that’s the attraction for Celer as well. His music is delicate and sometimes builds from crackles and now these crackles are present in playback and the piece will further decay and crackle and it will always make a new piece of music. Good choice, and perhaps a good gimmick, for once. Not to be repeated too often, I’d say.